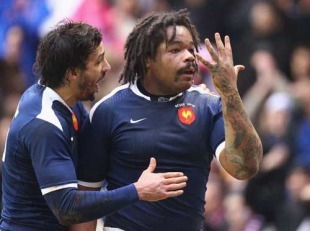 France have recalled rampaging centre Mathieu Bastareaud for their Grand Slam decider against England at the Stade de France on Saturday. The Stade Francais midfielder replaces Perpignan's David Marty after returning to full fitness, with Marty dropping to the bench despite scoring a brace in Les Bleus' thrilling victory over Italy last weekend. Marc Andreu, the diminutive Castres wing, retains his place out wide after notching his maiden Test try against the Azzurri and once again the halfback partnership of Morgan Parra and Francois Trinh-Duc has been retained. The balanced back-row of Imanol Harinordoquy, Julien Bonnaire and Thierry Dusautoir are called together again while the power up front will come from a lock pairing of Lionel Nallet and Julien Pierre and the front-row of Thomas Domingo, William Servat and Nicolas Mas. France are currently two points clear of Ireland in the table and are within touching distance of a first clean sweep since 2004. Lievremont admitted that finishing the tournament without the Grand Slam would be a huge disappointment despite the chance that they will take to the field on Saturday having already won the Championship due to other results. "It was one of the objectives from the beginning of the year," he said. "Even though mathematically we can think we'll win the tournament, to do so without the Grand Slam would be a huge disappointment. "We have a group that works well and is beginning to have a good experience. The new ones are fitting in well, like Marc Andreu for example who brought a lot of energy. England are a team with enormous potential. We all remember the last England-France match, last year at Twickenham. "They are capable of better, even if they have only shown that intermittently during this tournament. So we're going to prepare ourselves. It's a super team that we're welcoming. We haven't beaten them for three years. Like Australia. It would be good to do so before the 2011 World Cup."